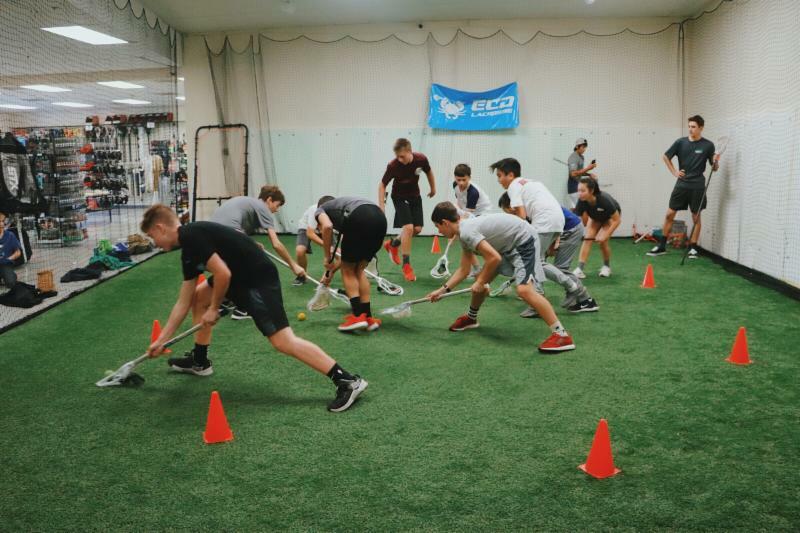 PLL - Sacramento Offensive Training led by Joe Walters: Team USA Indoor and Outdoor member, 3-Time 1st Team All Pro Midfielder, 5-Time Professional Champion, All-Star, 4-Time All American, 2-Time 1st Team Attackman of the Year, 2-Time ACC Player of the Year, University of Maryland Hall of Fame. 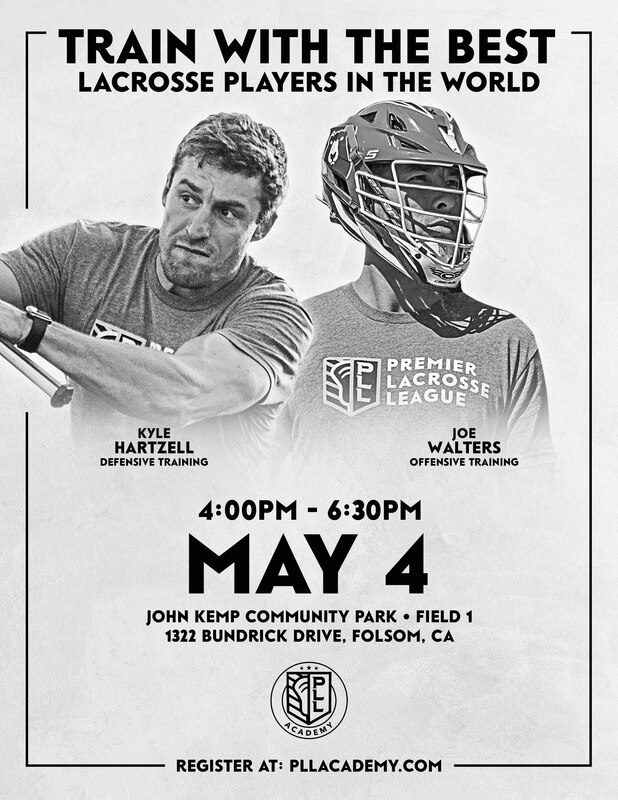 PLL - Sacramento Defensive Training led by Kyle Hartzell: 2 time Team USA member, world champion, 3 time professional champion, NCAA champion, 4 time all-star, all-pro defenseman, 2 time fastest shot record holder, and collegiate All-American. They were kind enough to create a coupon code for Sacramento Lacrosse. Anyone interested in signing up can use the code "SACLAX20" at checkout to save $20. Get your spirit wear before its too late! Don't resort to messy body paint to show your Stingers Spirit. 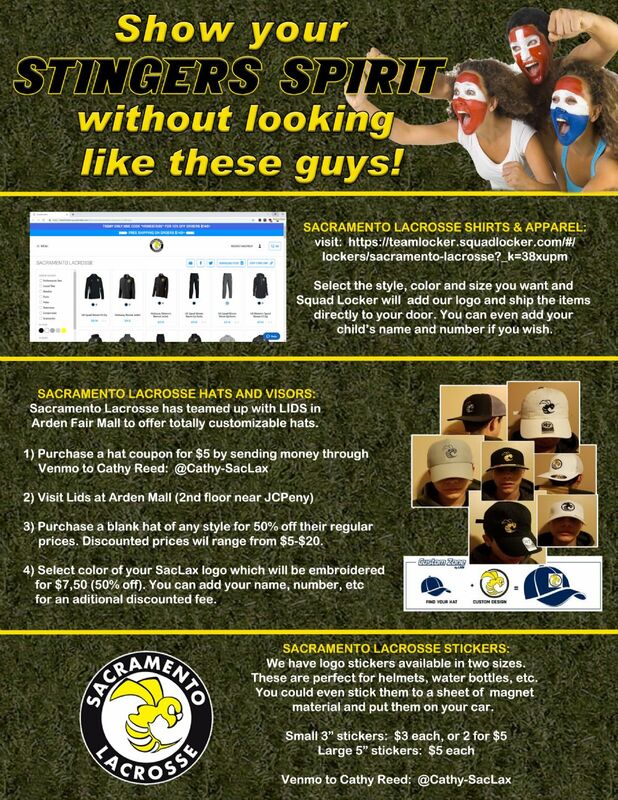 Get your swagger on in Sacramento Lacrosse spirit wear. 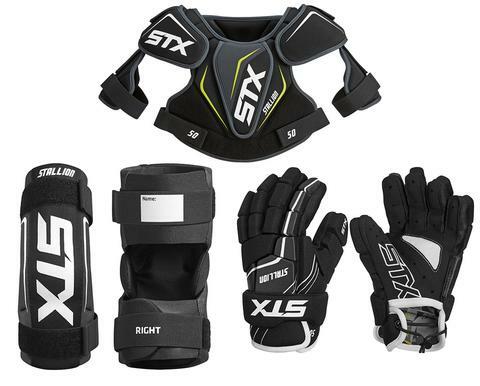 Get your SacLax gear before its too late! APPAREL: A complete line of T-shirts, sweatshirts, jackets and more is available to order directly from our partner Squad Locker. You simply pick out the styles, colors and sizes you want and they will add our logo and ship directly to you. Check out the on-line store! Be sure to ad your childs name and number to your items. 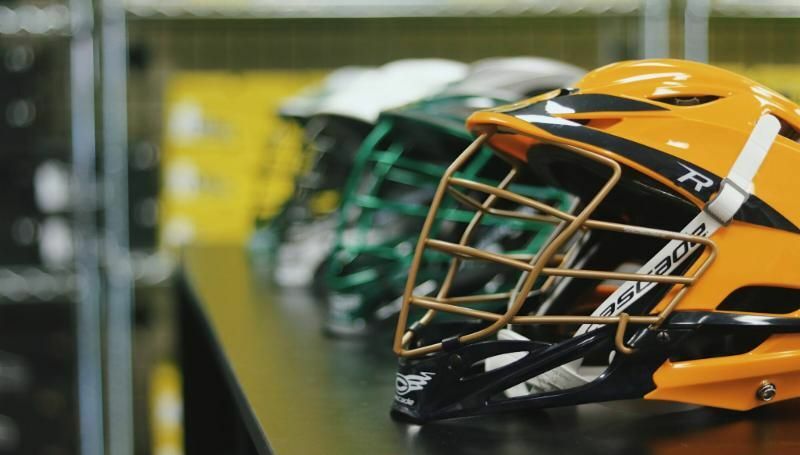 HATS: Fully customizable Sacramento Lacrosse hats and visors can be purchased locally at Lids in Arden Fair Mall. But purchase your $5 certificate from Cathy Reed and you will save 50% off the price of the hat of your choice. Then you pick your embroidery colors and our logo is sewn on for only $7.50 (also 50% off). You can add names, numbers etc. at discounted rates as well. But be sure you start by getting the discount certificate by sending your $5 via Venmo to Cathy Reed: @Cathy-SacLax. DECALS: We have Sacramento Lacrosse logo stickers available in 3" and 5" sizes. Slap a Stinger on your helmet, hydroflask, your car (put it on magnet material if you prefer), or even your little brother/sister. Small 3" stickers are $3 or two for $5. And large stickers are $5. Get yours by sending your money via Venmo to Cathy Reed: @Cathy-SacLax. However you choose to do it, be ready to show your support for SacLax on the sidelines this year! 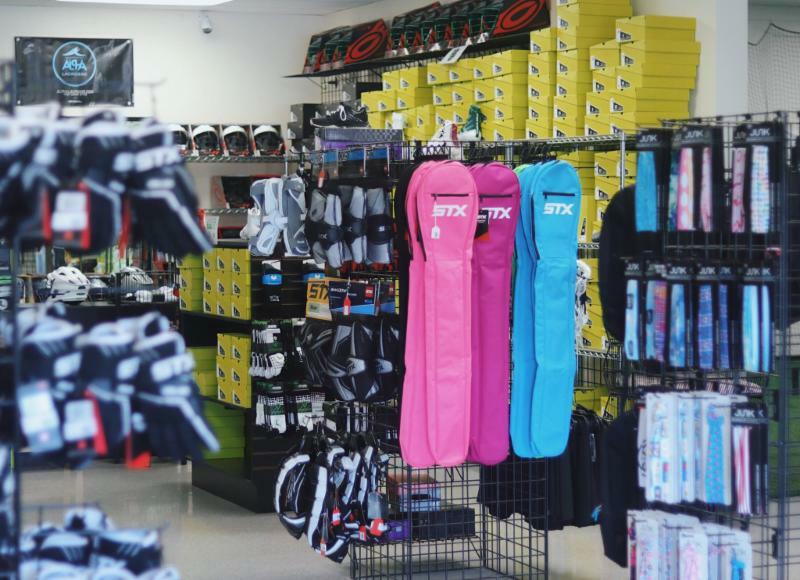 As the season gets a little closer, we just want to remind you that Lacrosse Fanatic has a full selection of gear for any age and experience level. They carry all of the top brands, at great prices. Mention our team’s discount code gosacstingers! at checkout so you can save 10% off your online or instore purchase all season long. This puts their prices on the newest gear below any other online store. 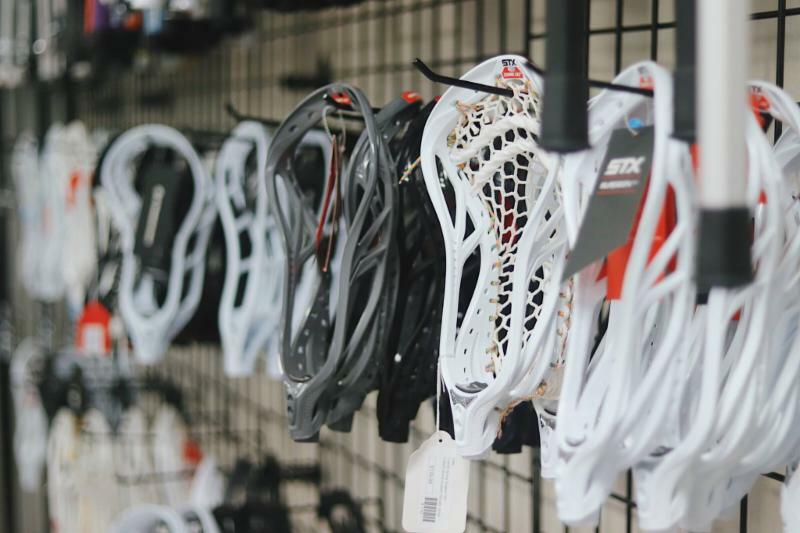 Lacrosse Fanatic is staffed with lacrosse players and coaches who never upsell and will work within any budget. They believe in long term relationships with customers who trust them. You can use your Team Discount Code ANY TIME online throughout the season as well as in store! Lacrosse Fanatic has created a team page specifically for our team, full of coach's reccomendations on gear for the season. Support the Stingers by volunteering to coach (or assistant coach) a team. Even if you aren't experienced, we could use your help. We have an exceptional on-line training program available to help you get up to speed. Alternatively, we also need referees. Many of our teams are registered into leagues where the referees are provided, but we also have some teams that play in leagues where the teams are expected to provide trained parent referees. Please click the Coaching Interest link if you are interested in helping in either position.